This Application doesn't work with Safari due to black screen (Copyright Protection, not even a Screenshot is possible), use Google Chrome or other Browsers instead! 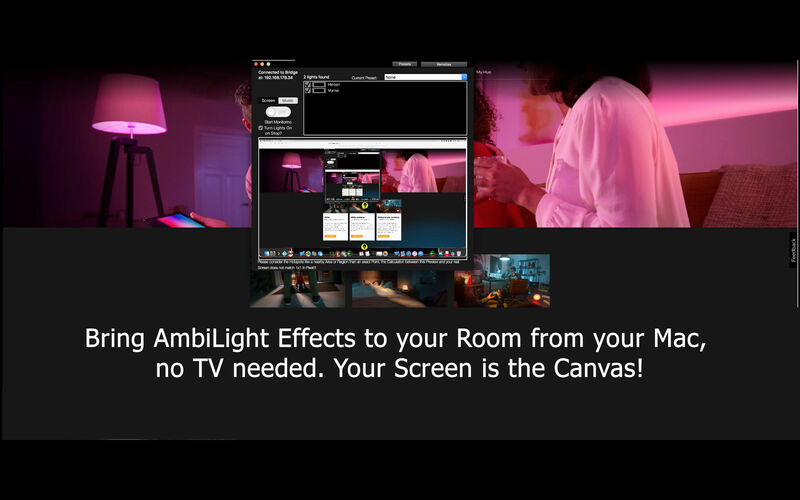 AmbiDesk for Hue uses the Philips Hue Light System to simulate an Ambilight Effect in your Room or wherever you use this Technology based on the Content of your screen. Once you connect with the Hue Bridge, you get a list of all known Bulbs in this Environment, you can choose which Bulb shall be used and which not. 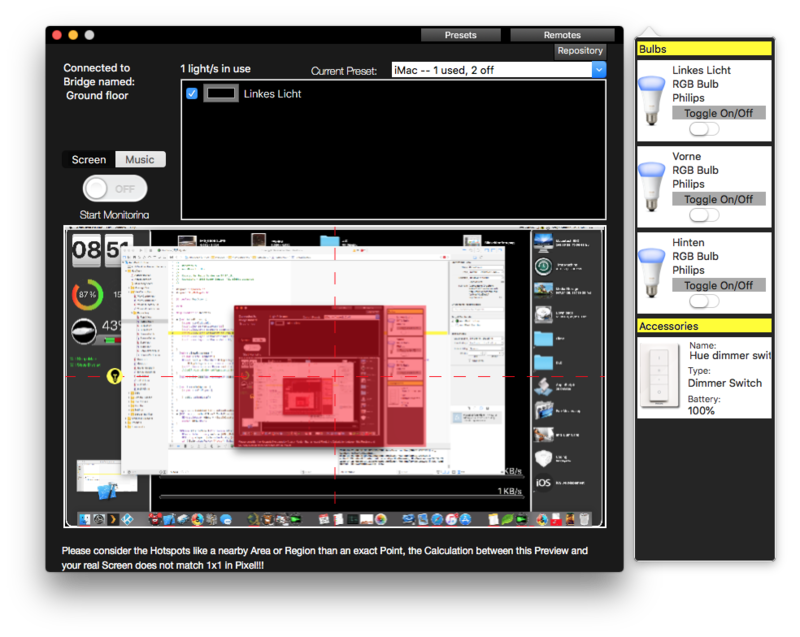 Once you enabled your Bulbs you want to use, you get a Preview of your Desktop/ Conent of your Screen with small yellow Bulb Icons for each Bulb you selected / enabled. Now you can position each Bulb on the Screen as : “This is my Point of interest”. HueDesk will monitor this Point for its Content for Colour changes to adjust the colour of your Hue Light. You can position each Build individually an dif you watch e.g. a Movie with top and bottom black bars e.g you can easily reposition your Bulbs, of if you have your Bulbs on the ceiling positioned as one front and one to the back e.g. you can setup your Point of Interest based on your Room, so HueDesk wants to be as versatile as possible. AmbiDesk for Hue works very straight forward and does not confuse you with dozen of settings and / or adjustments, HueDesk remembers your setup, so on the next launch you need to hit just one Button to start, also very important: if you stop a Movie at a very dark Picture and turn off HueDesk, all Lights will always auto restore to 100% white so you don’t need to readjust the lights with other remotes or similar. AmbiDesk for Hue has a quick access to all your Philips Hue connected Bulbs and Sensors/Remotes. The whole Repository, especially the Sensors/Remotes Section feels like off-topic, but in my personal experience, its very handy to have all the Infor right here without the need to search and find them elsewhere. But best and fastest way to quickly adjust your setup once you started or stopped monitoring to turn a specific bulb on or off or to see if a bulb is even reachable because you may have turned it off by the wall switch. AmbiDesk for Hue can be controlled via an iOS Remote App too. Its a free App in the App Store, once you have installed it, you can connect to AmbiDesk if already running on your Network anywhere and toggle ON/OFF State of AmbiDesk Monitoring. The Remote App also provides a quick look at what AmbiDesk for Hue sees right now on connect and on toggle Monitoring, it also displays your current "Points of Interest" Setup on this Preview. The Remote on iOS allows you to toggle Monitoring, toggle either Screen or Audio Mode and you can event tap and hold the Preview to get a live Image for what's on your Screen. What are Presets and what are they for? A Preset contains Lights and their Position you can setup in the main Window on the Desktop Preview Image by dragging and positioning them. 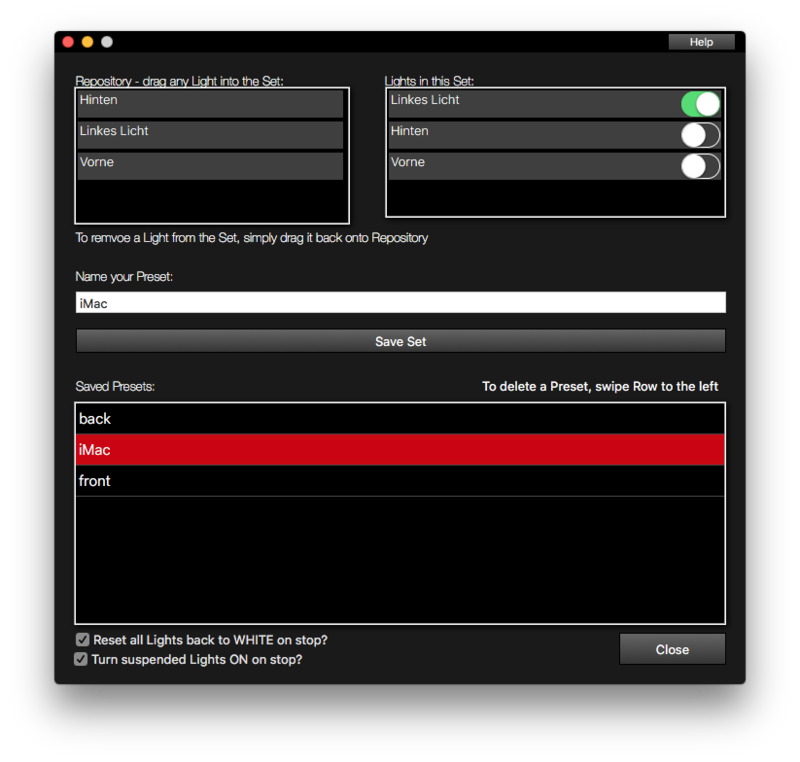 But if you have more Bulbs or just want to use various Setups for various Occasions, thats what Presets are, so you can config Presets for any Purpose to avoid to setup your lights on each start of AmbiDesk. E.g. : AmbiDesk has 2 modes, Video or Audio. For Video you would like to use one a certain Bulb, but for Audio you want to use your Ceiling Bulbs, so no need to change everything each time, simply use a Preset for this cases. Imagine, you have a Philips Hue Starter Set with 3 Bulbs which stick in your Celing Lamp and you decide to extend your Setup with Ambience Lights like a left and right Lamp next to your iMac's Display for a more Ambilight -similar Effect. Basically it is not a Problem to choose AmbiDesk to use only the left and right Bulbs next to your iMac, but what about the ceiling / room light? ow you can add Bulbs to your Preset and determine what shall happen with them once you start monitoring your Screen. In this Scenario, you can add the left/right Bulbs as well as the Ceiling Bulbs and tell AmbiDesk to turn the Celing Bulbs off while monitoring. This enables you to start your AmbiDesk Experience with just one click without further Actions or stand up for the Wall Switch. 1. Shall the turned off Bulbs be turned ON again automatically? E.g. : you start watching your Movie at the Evening, it dark outside and AmbidDesk turns off the lights for you for best Experience, but if you stop AmbiDesk, your Lights will go On and in White automatically, so you don't need to run through your Room in the dark to reach the Wall Switches or similar to make light again while all colours are dark or even black (imagine Post Credit Scenes in Movies, they are mostly while letters on black screen! 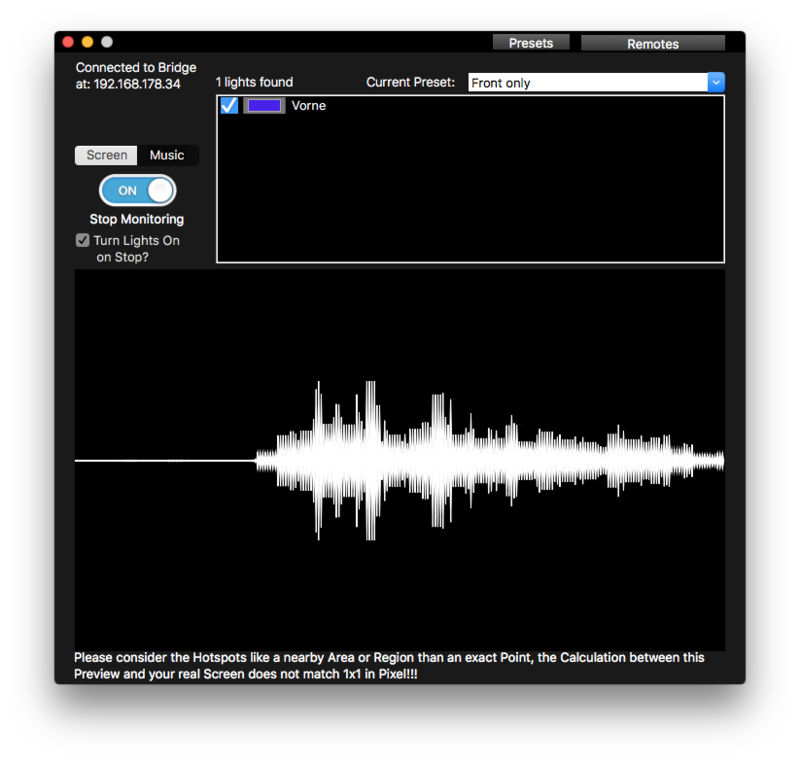 The Music Mode uses the built in Microphone of your iMac e.g. to access and listen for Audio Streams, either from the built-in Speaker, your WiFi or even Speech. Based on heard Audio, AmbiDesk for Hue will grab the currently heard highest Note of the Input and uses a Pitch-To-Color Map to send it to your Philips Hue Lights. This mode works also with your Presets and exactly the same as the default Screen Monitoring for AmbiLight similar visualisation, excepting that the Audio Mode does not support any Bulb positioning, while not needed. 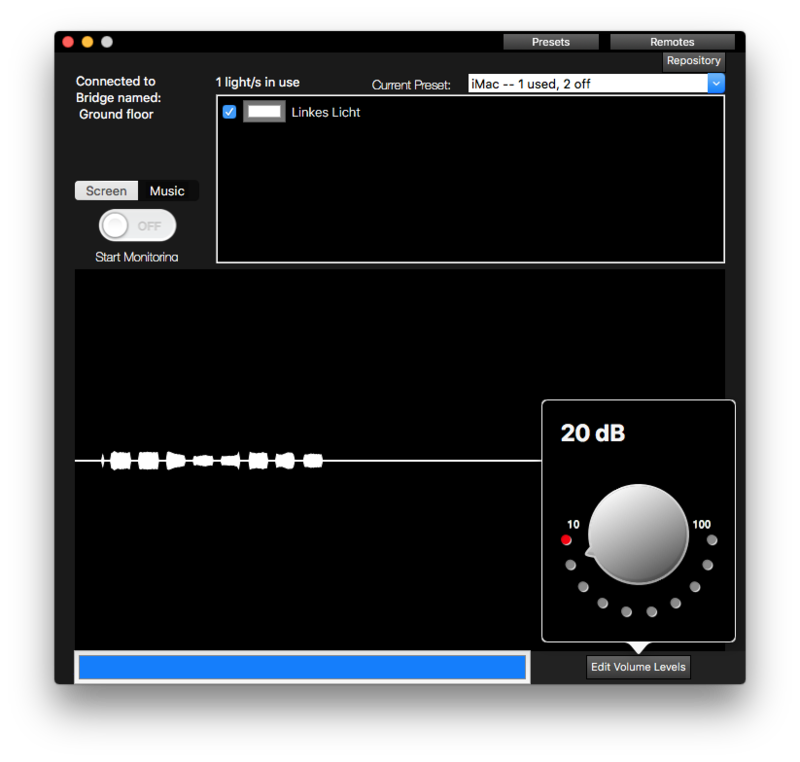 Additionally to this, the Music Visualiser has an additional extra: When selecting the Music Mode, you can fine tune the minimum level of sound needs to be made for Ambidesk to proceed this, this is made for situation like you don't want anyone talking, a dog si barking or similar to trigger AmbiDesk while it listens to your microphone, please note, the dB Levels are representative and not exact, this all depends also on your Microphone calibation in MacOS itself. Netflix, Amazon Prime or Browser based Streaming Services. Netflix or Amazon Prime, or any other streaming Service that works via Web browser to watch protect their Continent with something like DRM, you may heard of it, it is to prevent Piracy. A side effect of this is the following: Try to make a Screenshot of your Screen wile playing Fullscreen any Video from these Services and you will realise: You get just a black screen where the Video should be, even if you exit Fullscreen, you will see your Browser UI address-bar etc, but the Video is just a black box, this is by design to prevent Screen Recording from your Screen due to Piracy and Content Protection. Unfortunately, this affect Apps like AmbiDesk as well, so if AmiDesk cannot see what is playing (black screen), how it shall determine the correct cooler? I tried to check for Workarounds for this, but this is not possible because this is deeply integrated into MacOS or even iOS itself and any attempt would be a hack and may result from App Store rejections, sorry.